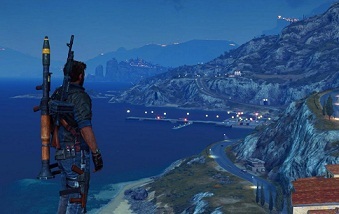 There are 15 aircrafts and 11 Ships available in Just Cause 3. Most of them are available free at the military base but for some you have to complete certain missions. For a special helicopter, you must collect all Di Ravello Audio Diaries. Helicopter: URGA Postolka - The most agile aircraft in Just Cause 3, and it is also equipped with the Minigun Janus-45S. To unlock this you have to liberate Baia province - Vis Electra military base. Helicopters: News Chopper - An insufficiently armored aircraft which is quite maneuverable, however. Helicopter: CS Navajo - To unlock this fast gunships you must liberate the Puncata Sud Province - Military Base. Helicopter: CS Comet - This fast and pretty well-armored aircraft can unlock once you liberate Aspera province - military base. Helicopter: URGA Hrom D - Fast and powerful aircraft, which is suitable for every fight. It is equipped with the Minigun Janus-88M and with 95 Volcanus missiles. However, you have to liberate Val De Mar province - Porto Coclea base military base. Helicopter: URGA Racek - You can cross long distances fast with this agile helicopter. To unlock this you have to liberate Capite West province - Porto Cavo militery Base. Helicopter: URGA Mstitel - You have to complete a certain mission to unlock this helicopter. Very quick, agile, well armored and always ready for battle. Helicopter: Golden URGA Mstitel - This golden aircraft you can unlock once you've found all audio diaries of di Ravello. Plane: URGA U17 Akrobat - An average aircraft on which you will get from A to B. Plane: CS7 Thunderhawk - It is equipped with an M98 machine gun, M-62 Mako and heat seeking M-78 Kaluga. To unlock this one you have to liberate Costa Sud province - Griphon military base. Plane: Stria Ghibli 3 - This aircraft will allow you to land sometimes on the water. Plane: U-7 Dravec - Although its armor is not particularly good, it convinced with all other values. To unlock this you have to liberate Maestrale province - Vulture military base. Plane: U41 Ptakojester - You can transport 10 land vehicles on this cargo flight and can fly long distance. To unlock this you have to liberate Falco province - Centcom military base. Plane: Carmen Albatros - Are you interested in a fighter aircraft of the 1940s. This aircraft really has style. You can unlock it by collecting its classic parts, liberating Costa Sud province - Griphon militery base. Fishing Boat: Minnow Fishing Boat - This vehicle is slow and unfit for combat. You will find 3 more in Just Cause. Fishing Boat: Whale Shark - This boat is slow but also powerful, however it is not suitable for the fight. Sailboat: Brise 32 - Do you want to join the elite of Medici, then get this powerful boat. Yacht: Dame De La Mer 99 - This is Powerful and agile luxury vehicle. Speedboat: Pescespada SS - This watercraft is the fastest boat in Just Cause 3. In addition, it is very agile and can go 70 knots (nautical miles per hour) in calm water. Transport ship: URGA Hroch - with enormous power and good armor, this vehicle is not suitable for fight, but great for transport. To unlock this one you have to liberate Corda Dracon province and take over the Corda Dracon: Centcom militery base. Gunboat: CS Powerrun 77 - A powerful boat that is well armored and suited for combat. To unlock this one you have to liberate Trio province and take over the Porto Darsena military base. Corvette: Rebel Corvette - A huge battle boat with very strong armor and fire power. To unlock this warship you have to liberate Maestrale province and take over the Porto Tridente military base. Jetski: Stria PW 220 R-GT - You can fly over the waves with this incredibly agile watercraft. However, it have only a small armor. Speedboat: Squalo X7 - This boat is not only very powerful and manoeuvrable, it also has a strong armor.